Let's call this a "Making Of" or "Behind the Scenes" story. You know me, I don't like stuff. I like multi-purpose objects that store nicely, not bulky one-use-only things like studio lighting or elaborate photography props. So how do I shoot my product photos for Jasper & Love, like this one? Simple! First, use natural light ALWAYS. This is more difficult half the year when I'm only home during daylight on weekends. Second, white reflects light. I keep a light source on one side and a piece of white paper on the other, to keep the shadow from getting too dark. As below, white paper below the set is also helpful. Third, glass! I love glass backdrops, because the surface abstracts whatever is actually there. This will become more interesting in following images. Once more with feeling! This time I'm shooting toward the window, instead of straight back into the white. I adore this shot. The warm tones in the earrings pop because the background is so blue. It would be better if the background were more blurred - I'm working on that. 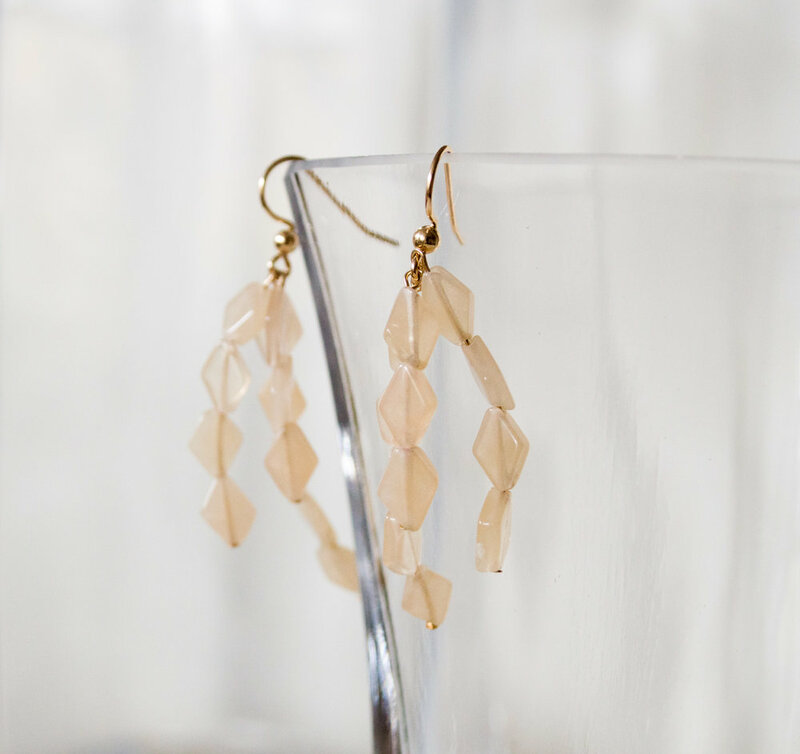 Using a low fstop blurs the background window, and using a glass vase abstracts it further while being visually less distracting than the black earring holder. Here's the final shot. Now that you know it's there, you can see the window frame, right? Similar setup, as seen from above. Instead of shooting into the window, this time I'm shooting perpendicular to the window, with glass-in-front-of-white-paper as the backdrop. Here's the final shot. While I love the abstracted nature of the previous, you can see that a white backdrop is less distracting. And adding the glass makes it less boring and impersonal than a simple white sheet backdrop. (I tried that, it looked robotic.